If you’ve ever watched weightlifting in the Olympics, you’ve likely seen the clean and press. There are many variations on this movement, but in its most basic sense, it simply involves lifting a heavy weight off the floor and over your head in an explosive fashion. There are many ways to fit the clean and press into your routine. You can load up the bar and do a single rep as a test of strength, or use it as a conditioning exercise by doing high reps with a low to moderate weight. In spite of these two terrific applications, I hardly ever see anyone doing them at the gym. I’ve often thought of the movement involved in the clean to be the opposite of a muscle-up. Instead of using your explosive power to get your body up over a bar, when you do a clean you’re using it to move the bar up over your body. The clean starts like a deadlift, but continues all the way up until the bar is caught in front of your chest (similar to a front squat). The movement is initiated from the hips; as you pull the bar straight up in front of you, your heels should come off the ground. When the bar is as high as it can go, you drop down underneath it, making a shelf with your arms to catch it. Just like the clean, the press is initiated from the hips and lower body. The arms should almost become an afterthought. The power from your legs should transfer up into your arms seamlessly as you complete the lift. The balance of a kettlebell is different than that of a barbell due to its shape. Get comfortable with the proper kettlebell swing before learning cleans. You must learn to use your hamstrings, glutes and core muscles to generate power from your hips. 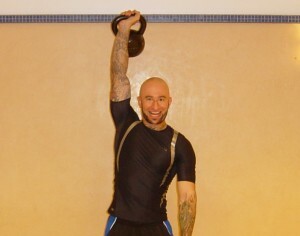 Since kettlebells aren’t connected, you can rotate your forearms when you’re doing cleans with them. If the barbell clean and press is like a bar muscle-up, the kettlebell clean and press is more like a muscle-up on rings. Turn your wrist through to prevent the kettlebell from flipping over and smacking your arm too hard. The clean and press is a complex movement; it takes practice to get the feel and the timing of it, so start with light weight. It is best to have a trainer present when learning a difficult new exercise. Thanks to Nimble Fitness for letting me film in their facility. I bought a 16kg one just about a week ago and I’m struggling with it lol. Can’t wait until I get to a point where I can just swing it around and press as quickly as you(and others)do. My clean and press is abit slow right now. Also, question: Am I right in assuming that a slow controlled raise and lower builds muscular strength? While an explosive raise and lower builds explosive strength? For the single KB clean and press I used a 55 pounder, for the doubles I was using 45s. You’re right about the correlation between speed and power, however the clean and press is an explosive movement – I would not suggest doing it slowly. It’d be like trying to do a slow, controlled box jump. Ah right. Still alot more than I can lift right now anyway lol. Keep practicing, Matt! You should also consider working with a trainer to help perfect your technique. I shall try to find a trainer, though really I’m not holding out hope, I doubt that the trainers around my area in the gyms even know what a kettlebell is lol. Good to see you lifting the kettlebells. Last night I was teaching some folks the clean and press. The clean looks easy, but is one of the more difficult moves to learn in kettlebell. 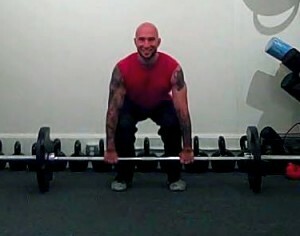 looking forward to more of your videos…… perhaps the deadlift with a bar and the kettlebells? Thanks, Lance – like you said, the clean is a difficult lift to learn. I wouldn’t recommend trying to do so without some formal instruction. I might do a video on deadlifting at some point. I hope to get to where your at. Hey Arcel! It’s within your potential to do anything that I can do, it just takes time and dedication. I haven’t seen you at bootcamp in a while – you should come this Saturday! Al what do you recommended to increase the repetitions? the 50 pull-up challenge or the twenty pull up challenge? The 20 pull-up challenge is a good way to test your reps.
Those articles are about pull-ups, but you can do a 20 rep or 50 rep challenge with the clean and press! If you keep at it then everything will fit together, that goes for anything really and it’s never more apparent than when you see and feel improvements like this. Right on, Mattman! There is no better teacher than experience. Love the sound! Al, where is this from? This video was shot at Nimble Fitness in NYC. I honestly don’t know what the music is – it’s just whatever happened to be playing on Pandora in the background. Apparently I didn’t give much consideration to that type of stuff in the early days of my blog.